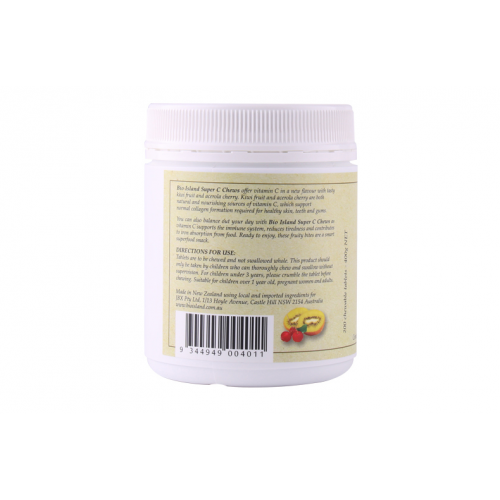 Contains kiwi fruit and acerola cherry, as natural sources of Vitamin C.
Vitamin C as an essential antioxidant helps maintain a healthy immune system, reduces tiredness and contributes to iron absorption from food. 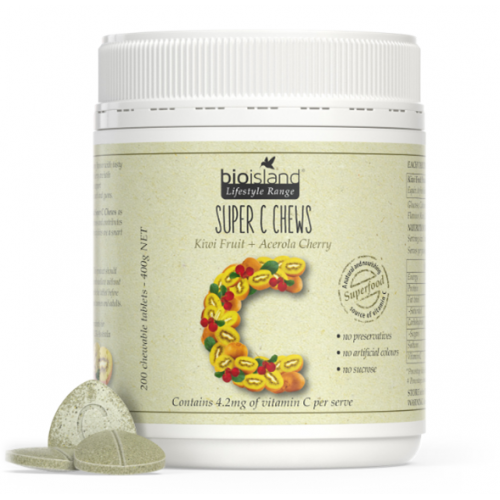 Vitamin C supports collagen formation for healthy skin, teeth and gums. Children 1 year and over take 2 - 3 chewable tablets per day. Adults, including pregnant women, take 3 - 5 chewable tablets per day. *Tablets are to be chewed and not swallowed whole. This product should only be taken by children who can thoroughly chew and swallow without supervision. For children under 3 years, please crumble the tablet before chewing. Suitable for children over 1-year-old, pregnant women and adults.